MILFORD, Pa. -- A law enforcement official says the intense hunt for a survivalist suspected of ambushing troopers at a Pennsylvania state police barracks was like looking for the "proverbial needle in a haystack." Major George Bivens testified Monday in the trial of 33-year-old Eric Frein (freen), who's charged in the 2014 attack that killed Cpl. Bryon Dickon II and wounded a second trooper. Bivens says the manhunt spanned more than 300 square miles (777 square kilometers) of rugged Pocono Mountain terrain and involved as many as 1,000 law enforcement officers over 48 days. He says the search was slow because Frein was armed and had left two bombs at a wooded campsite. Frein was captured by U.S. marshals at an abandoned airplane hangar. 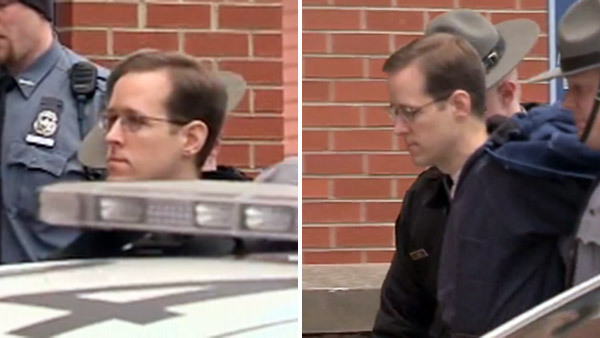 Frein faces a potential death sentence if he's convicted. Troopers take stand in Eric Frein trial, describe shooting. John Rawlins reports during Action News at 5pm on April 5. Trooper describes barracks ambush at Frein trial: John Rawlins reports during Action News at noon on April 5. Watch John Rawlins report from Action News at 4 p.m. on April, 4, 2017.